For three years at the turn of the last century Nick Altrock was arguably the best left-handed pitcher in the game. His talent, pitching smarts, and extraordinary fielding ability helped him win 62 games for the Chicago White Sox from 1904 through 1906 and beat Mordecai Brown in Game One of the 1906 World Series. However, Altrock's baseball prowess was overshadowed by his second career as one of the most-popular and longest-working baseball clowns of all time. At his clowning peak, Altrock enjoyed a salary that rivaled Babe Ruth's. Nicholas Altrock was born in Cincinnati on September 15, 1876. He used to joke, "the country was born in 1776 and Nick Altrock was born in 1876. But somehow my parents slipped up. I should have been born on the Fourth of July." Nick's parents were part of Cincinnati's burgeoning German population, and like many children of immigrants in the city's Over-the-Rhine neighborhood, Nick took up America's game. As a young man in Cincinnati he established a reputation as a good pitcher in the semi-pro leagues around the city while working as an apprentice cobbler. Altrock soon realized that getting paid for baseball was more fun than getting paid to fix shoes, but his father initially disapproved of the boy's priorities. "I thought he was a hopeless case the way he stuck to baseball," Christian Altrock later told the Chicago Tribune. "I was discouraged and thought he would never amount to a row of pins." In 1898 Altrock got his first job in organized baseball pitching for Grand Rapids (Michigan) in the Inter-State League. He won 17 games against just three losses, leading Barney Dreyfuss of the Louisville Colonels to purchase the lefthander's contract. Nick went 3-3 for the Colonels but spent more time drinking and partying than preparing for games. Manager Fred Clarke sent him back to Grand Rapids in 1899. From 1899 to 1902 Nick knocked around the minors, pitching and partying. He threw for Oswego and Binghamton in the New York State League, Syracuse and Toronto in the Eastern League and Los Angeles in the California League. With Milwaukee of the American Assocation in 1902 Altrock finally put it all together, finishing the season with a 28-14 record in 338 innings of work. Impressed, the Boston Americans acquired him near the end of the season. Despite posting an ERA of 2.00, Altrock lost both his starts. Boston was the best team in the league in 1903, but manager Collins preferred his veteran aces Cy Young and Bill Dinneen to the young Altrock. Collins sold Nick to the White Sox early in the 1903 season, and though the trade cost him an opportunity to pitch in that year's World Series, Altrock quickly established himself in the Chicago rotation, going 4-3 with a 2.15 ERA to close out the season. The following year he was even better, posting a 19-14 record in 307 innings of work, second most on the staff. The White Sox under fiery Fielder Jones were one of the best teams in the new American League, and in 1905 Nick almost pitched them to a pennant with a fine 23-12 record with a 1.88 ERA, the fifth best in the American League. Altrock's 315 2/3 innings pitched were a career high, and Chicago finished in second place, two games behind the Philadelphia Athletics. The following year Chicago stormed to the top of the league, winning 93 games and holding off a late charge by the New York Highlanders to capture the American League pennant. Altrock was once again a key factor in the club's success, as he finished the year with a 20-13 record and 2.06 ERA in 287 2/3 innings of work. Due to their .230 team batting average, few observers gave the "Hitless Wonders" much of a chance in that year's World Series against the powerhouse Chicago Cubs, but manager Fielder Jones remained confident in his team's ability to compete. In any clutch situation, Jones said, "I would send Nick Altrock to the slab, and show me any pitcher in the league who is better acquainted for just such an emergency." Nick rewarded Jones' faith by tossing a four-hitter to beat Cubs' ace Mordecai Brown in the first game, 2-1. Brown took the honors in their Game 4 re-match 1-0, but Nick posted a 1.00 ERA for the series. In the second game Altrock set a Series record for chances handled by a pitcher in one game with 11--8 assists and 3 putouts. Nick also set a record for most chances in a six-game Series with 17. Hippo Vaughn later tied that mark in the 1918 series, except Vaughn pitched three games to Nick's two. It was a fitting accomplishment, given Altrock's reputation as one of the finest fielding pitchers of his or any other generation, thanks in large part to an extraordinarily deceptive pickoff move. In 1901, while Altrock was pitching for Los Angeles in the California League, Nick reportedly walked seven men intentionally and picked off six of them. Altrock still holds the record for most chances accepted by a pitcher in a nine-inning game (13). Despite his considerable talent and success on the mound, Nick never took his playing very seriously. His contemporaries described him as "carefree" and "eccentric" as much as "tough." Nick was known to take a drink or three after a game, and some writers blamed Nick's love for malt brew for his decline after the 1906 Series. Altrock himself once said, "I never took but two things seriously in my life. My clowning and my golf." In February 1908 Altrock married Hannah Weddendorf, but she soon grew weary of Nick's late night habits and the couple was divorced in 1912. Two years later, he married Eleanor Campbell. Nick's inattention to training may have contributed to his poor 1907 season. He hurt his arm and his record fell to 7 wins and 13 losses as the Sox fell to third place. In 1908, Altrock's record was only 5-7, and the Sox lost the pennant on the last day of the season to the Tigers. In May of 1909 Chicago owner Charles Comiskey traded Altrock, outfielder Gavvy Cravath, and first baseman Jiggs Donahue to the Washington Senators for Bill Burns. Nick didn't pitch well for Washington, and later that year found himself back in the minors playing for the Minneapolis Millers. Nick's career as a major league pitcher may have been finished by 1909, but his second career was just beginning. Altrock barely hung on in the minors for three years pitching and coaching. Then one day in 1912 when Nick was coaching third base for Kansas City in the American Association, he decided to imitate a film he had seen the previous night of a shadow boxing exhibition featuring featherweight champion Johnny Kilbane. Altrock opened with a roundhouse right to his own chin and fell to the ground. Then he picked himself up and went at himself again, as the crowd roared in bemused delight. Nick finished by knocking himself out to raucous applause. Unfortunately, Nick's comic routine didn't amuse Kansas City's owner, Patsy Tebeau. Altrock later liked to tell the story of how Tebeau, called Nick into his office to say that he was releasing him. "Don't worry about me, Mr. Tebeau," Nick told the owner. "Why, with my face, I might break into movies." And what a face it was. With a big wide nose spread out to his cheeks and two jug handles for ears, his face looked like an iron had flattened it. With his cap sitting sideways and slightly askew on his head and usually with a big grin on his face, Altrock looked like a born comic. He always enjoyed fooling around, and now Nick was about to make a career of it. 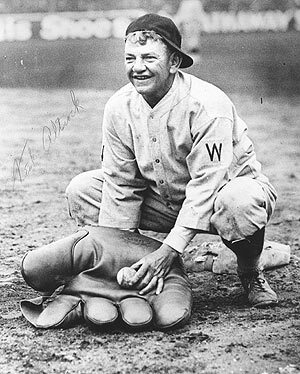 Nick took his release from Kansas City in stride because he already had an offer from manager Clark Griffith to join the Washington Senators as a "comedy coacher." The Senators already enjoyed the services of Germany Schaefer, one of the most colorful eccentrics ever to play baseball. However, in his first few days with the club Nick was buried deep on the bench. Then one day the Senators were losing to a strong Cleveland pitcher named Vean Gregg. Griffith turned to his rubber-faced acquisition and said, "What good are you?" Nick said seriously, "I'm the king's jester." Then he asked, "Do you really want to win this game?" Griffith said, "With your pitching I suppose?" Altrock said, "No. With my coaching." Altrock talked Griffith into sending him to the first base coaching box. The next time Griffith looked out to the field he saw Nick in a heap on the ground finishing a pantomime of a man who spiked himself with his own shoe. Gregg was laughing so hard he started heaving the ball over the middle and the Senators starting hitting. Altrock morphed the routine into a full wrestling pantomime, pinning himself for a victory. Finally, home plate umpire Silk O'Loughlin, himself doubled over with laughter, ordered him to stop. Naturally the newspapers reported this strange behavior and more fans started to turn out for Senators games. American League President Ban Johnson attended one of Nick's early games, and decided to allow his antics so long as they didn't interrupt play. Nick was funny enough by himself, but his routines really began to soar when he added a partner. At first he did routines with Schaefer, until Schaefer signed with Newark of the Federal League in 1915. Then Altrock teamed with reserve Carl Sawyer for two seasons, then worked solo for two seasons until 1919, when the Senators acquired another washed-up pitcher, Al Schacht. Altrock and Schacht became the Martin and Lewis of baseball comedy. They created a series of pantomimes that they performed at games, including bowling, juggling, golf tricks, rowing boats during rain delays, mocking umpires, and other tricks. The two of them regularly headlined vaudeville bills, and became part of the eagerly anticipated entertainment for the World Series and All-Star games. Altrock made more money at his peak in the 1920s than almost any other ballplayer. His salary from all his various appearances was reported in the $180,000 range. Ironically, in the midst of this success Altrock and Schacht stopped speaking to each other in 1927. Although Altrock never spoke about the specific reasons for it, their rift was often attributed to a fake prizefight routine that got a little too real. The story is that Schacht thought it would be funnier if he actually hit Nick and so punched the older comic unexpectedly and knocked him to the ground. Altrock got revenge a few days later during a routine where he would normally fire a hard baseball at Schacht for him to dodge and follow it with a soft baseball that Schacht took on the head. Altrock switched the baseballs, and Schacht took a hard blow to the skull and hit the turf. They continued their successful performing partnership until 1934, when Schacht joined the Red Sox. Nick continued as a coach and clown for the Senators until 1957, when he was 81. Until the 1930s, the Senators would often let Nick play in one of the games at the end of the year. Nick remains the oldest player ever to hit a triple, doing it in 1924, when he was 48. The newspaper accounts claimed the outfielders weren't running very fast after the ball, but Nick still whaled it a long way. He hit a clean single in 1929 at the age of 53, and made his last appearance in 1933 at the age of 57. That makes Nick the third oldest man to appear in a major league baseball game, with the only older players being Satchel Paige, 59, and Minnie Minoso, 57. Altrock is also one of the few major leaguers to play in 5 different decades. Nick spent his baseball seasons in Washington, DC and his winters in Sarasota, Florida. He passed away on January 20, 1965 in Washington at the age of 88. After Nick's death Al Schacht said of his former partner, "Nick was a great comedian ... I have never seen anyone with better facial expressions. And we should all remember that he was a fine big league pitcher as well as an exceptional entertainer." He was survived by his wife of 50 years, Eleanor, and was buried in Vine Street Hill Cemetery, in Cincinnati. Nick Altock's file at the National Baseball Hall of Fame. Tom Deveaux. The Washington Senators 1901-1971. McFarland & Co, 2001. Shirley Povich. The Washington Senators--An Informal History. Putnam, 1954.